Fall Creek Farm & Nursery has announced succession of its top leadership. After forty years, company co-founder and blueberry industry innovator Dave Brazelton will step aside as chief executive officer (CEO) to assume a new role as executive chairman of the privately-held global company’s board of directors. Effective January 1, 2019, Amelie Brazelton Aust and Cort Brazelton will assume the roles of co-CEOs. 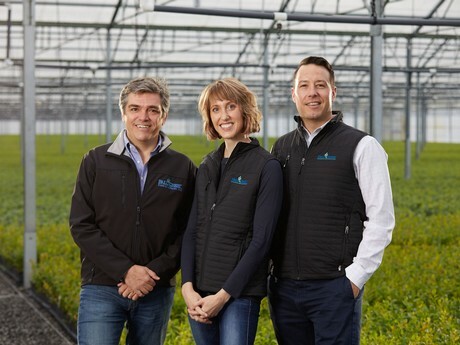 In addition, Oscar Verges, who joined Fall Creek as chief operating officer (COO) in 2016, recently was promoted to president and COO of the blueberry breeding and nursery company. The three executives will lead the company’s strategy and growth, and the team of functional and regional directors will continue to report to Verges. Cort Brazelton is currently the director of business development and interim director of sales for Fall Creek’s European business. Before joining Fall Creek in 2008, he was the blueberry business manager for Driscoll’s, the global marketer of fresh berries, and principal of Brazelton Ag Consulting. He produces and authors the biennial World Blueberry Production Report for the United States Highbush Blueberry Council (USHBC), the industry’s primary reference for blueberry production statistics and trends. He is an active member of the USHBC USDA Commission and one of the founders of the International Blueberry Organization (IBO) where he currently serves as an advisor to the board. He studied economics and policy at Monterrey Institute of International Studies in Monterey, Calif., and earned a Bachelor of Arts degree in history, German and music from Oregon State University. All three members of the leadership team are based at the company’s headquarters in Lowell, Ore. They frequently travel to other Fall Creek locations and industry events around the world.